After graduating from Michigan State University with a degree in Nursery Landscaping and becoming a Certified Green Industry Professional (CGIP), a dedicated young man named Kevin Jones had dreams for a green future. In 1996, that young man’s passion became Kevin’s Landscaping. Starting with that core landscaping service, the company has continued to grow year–by–year, thanks to the efforts of a dedicated staff. 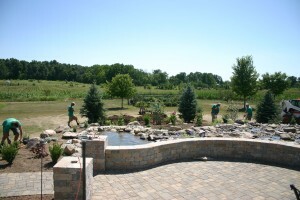 Since then, Kevin’s Landscaping has developed into a full–service company that, in addition to creating beautiful landscapes and hardscapes, offers bulk sales of mulch and soil products, irrigation installation and maintenance, lawn mowing services and snow removal and mitigation services. We are proud members of (MNLA) Michigan Nursery Landscaping Association, (ICPI) Interlocking Concrete Pavement Institute, NFIB (National Federation of Independent Business, Certified Green Industry Professionals and continual education classes are taken as the industry grows. At the root of every successful business is strong client relationships. From day one, Kevin’s Landscaping has cultivated strong client relationships by performing quality work with a personal touch. Many of our clients have been with us since the beginning, and continue to be dedicated customers who provide ongoing references and recommendations. Since 1996, our number one goal has remained the same: create solid client relationships through quality workmanship, a professional attitude, continual education and a personal touch.